The four Servant Sisters from the community in Valencia – Sr. Elena, Sr. Zdenka, Sr. Maria, and Sr. Allison – hit the road on Sunday morning in their little car, headed off to Barcelona. Ana was waiting for us when we arrived at her house, along with her daughter Ana and Olga as well. Manolo, Olga’s husband, arrived with their kids, along with the car that was going to be used to bring the food, the guitar, and whatever else was needed; we loaded up the car and went together to St. Agnes´ Parish, where we were going to have the meeting. 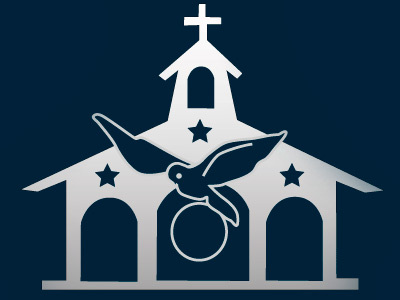 We attended the 12 o’clock mass at St. Agnes´ Parish. Afterwards, we took a look at the parish rooms, which the parish priest had generously let us use, leaving everything at our disposal: the rooms, kitchen, bathrooms, projector screen, a small patio and a playroom for the kids…it was wonderful! 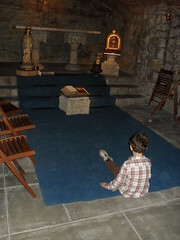 To top it all off, there was a little chapel with the Blessed Sacrament. They told us that once it had been prison cell where martyrs were tortured and killed during the Spanish Civil War (1936-39). We began by having a meeting before eating lunch. Ana Pelaez presented the Sisters and everyone else introduced themselves as well. There were all kinds of people there: families that were already a part of the Home, people that came out of curiosity or because someone had invited them, and people who want to know more about the Home. There were 40 people, counting adults and young people, and around 15 children; we filled up all the rooms. 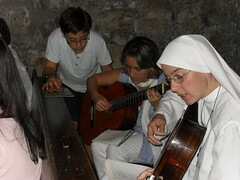 Everyone wanted to hear the Sisters´ vocation stories, how they had met the Home, where they were from, etc. Each Sister told a little of their background. The people were impressed that we were four Sisters and that each one of us had come from a different country. We then had the opportunity to explain that it was not done on purpose, nor was it a marketing plan, but that it was because Our Blessed Mother wanted it that way, the only thing that we do is respond to the call. It was then lunchtime – which made the kids really happy. Everyone had brought food to pass around and there was a hearty buffet for everyone. We had a really nice time talking, getting to know one another, etc. After lunch, we showed a video of the presentation of the Home. We then explained it a little and people could ask any questions that they had. Jordi Suriol, Ines, Raquel and Luis, Olga and Manolo, who already knew the Home, told the others about their experiences. To bring an end to the day, we went to the chapel to pray the rosary together, accompanied by songs to Our Lady. The time came to leave. After cleaning up quickly and leaving all the rooms tidied up, we say goodbye to everyone. Everyone was very happy when they went home and they all wanted to do the same again soon. 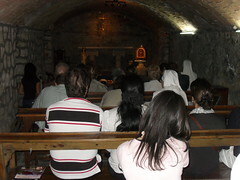 The Sisters in Valencia are going to go to Barcelona every third Sunday of the month in order to spend the day there. It seems that Our Lady wants the Home to be present in Barcelona as well. We are praying that everything goes according to Her plans.